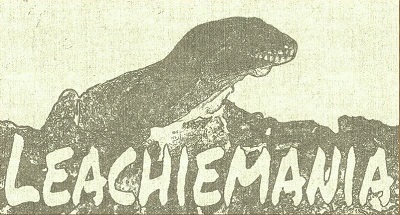 Rhacodactylus leachianus is the largest species of living geckos in the world. It is a nocturnal arboreal species of gecko. 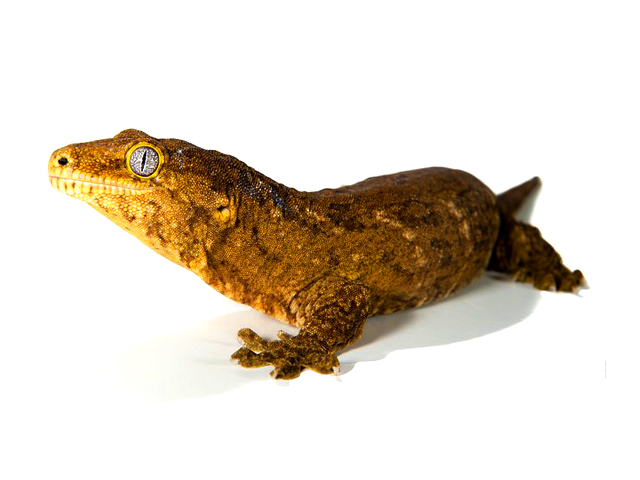 This stout gecko has a short blunt tail and its skin, which has many loose folds, seems too big for its body. Unlike most geckos, Rhacodactylus leachianus has claws on its toes, and these, along with a grasping pad under the tail, help it cling on to tree trunks. Here they are perfectly camouflaged – their mottled light and dark grey, olive-green and pale brown colouration merges perfectly with the underlying bark. Hatchlings and juveniles can be housed individually in plastic boxes or small terrariums, 0.3 x 0.2 x 0.2 meters (0.9 x 0.6 x 0.6 feet). Adults can be housed individually or in pairs in large terrariums, 0.8 x 0.8 x 0.6 meters or larger (2.5 x 2.5 x 1.8 feet). Cork tubes make great hiding and resting place for this species. The rough surface of the cork also helps the geckos shedding their skin. Substrate such as coco fiber, eco earth or forest soil works just fine. Light and heat can be provided, and is highly recommended. Although many people believe that they do just fine without lighting or heating. I personally provide 15 watt neon lamp for my leachianus, especially for pairs. Gravid females can often be seen basking under the heat source. Warm side of the terrarium should be 26-28 ºC (78-82 ºF) and ambient temperature should be 22-25 ºC (71-77 ºF). A water bowl at one corner of the cage can be provided and should be changed and added regularly. These geckos require 60% – 80% of humidity. This humidity level can be reached by light daily misting. Note: Only mist one side of the enclosure, NEVER mist nor spray the geckos or their usual resting place. Many keepers are only using commercially available gecko diets to feed their geckos. I occasionally use commercial diets, but I mainly use a homemade diet to feed my geckos. My homemade diet consists of various fruits mixed with multivitamins, calcium, and other essential minerals. I also offer dusted insects regularly and pinky mice occasionally. I personally do not handle my leachies frequently as some other people do. However, Leachies can tolerate light handling. Most juveniles are very jumpy when handled, but with time they´ll become calmer. Some will never be calm and can be very territorial and aggressive, which in my opinion, it indicates a healthy gecko and a natural behaviour of this species. A regular cleaning is recommendable to maintain a healthy environment. Springtails or isopods can also be used to maintain clean substrate. Humidity level plays a big role during shedding for this species. If the humidity level is achieved, there should not be any shedding issue. They also eat their shed. There are several health issues that appear in leachies, such as metabolic bone disease, skin infection and obesity that can be avoided through proper diet and husbandry. Skin infection is the most dangerous health issue in my experience so far, it can costs death.